Yes, it's another outfit post. I couldn't help myself, though, because I was just so excited when this dress arrived, yesterday, that I had to wear it straight away! So, I did - I wore it out, last night, when I went to dinner with a friend. I think it's just one of the loveliest dresses. I really ought to have taken a close-up of the pattern. 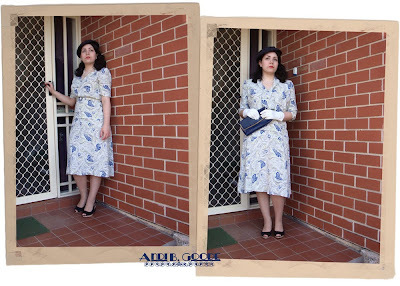 Outfit details: 1950s linen hat - etsy; faux pearls - Hero vintage; 1940s dress & jacket set - etsy; gloves - Salvo's; stockings - Love Kylie; shoes - KMart. And, this isn't entirely related, but I wanted to share a song with you all that has just captured my heart. I copied it off a CD I borrowed from the library a few months ago but never really listened to it properly, until today, and I've been listening to it on repeat. It's a medley of The Way You Look Tonight and A Fine Romance, both of which were featured in the film Swing Time - I think there's something very touching about this medley. I hope everyone is having a swell weekend! Such an amazing dress, you find the most fantastic vintage pieces, Andi sweetie! Please never stop sharing your wardrobe photos with us, they are pure inspiration to me (and I'm sure oodles of others, too!). Wishing you a gorgeous weekend, hon! That is such a good song! I love the Comedian Harmonists. Have you seen the movie? Jessica: Aw, thank-you so much. =] It makes me happy to hear that. Hanne: No, I haven't seen the film but I definitely want to, now! Rose: Thanks. Yes, it's been great dress weather! Ooh, it's beautiful! You look lovely. Looking good as always - lovely print! What a darling dress Andi! Torie Jayne: Thank-you so much!